At first glance, I thought the controversy over Apple’s iPad Mini and its non-Retina display quality was more of a battle among geeks than a real issue for consumers. When I tried the device at arm’s length in an Apple store, the resolution did not jump out at me as noticeably diminished from what I was accustomed to on the iPhone 5 and Retina Display on the iPad. I figured that the gadget bloggers needed to take their jeweler’s eye loops off and see the technology through the eyes of the typical consumers. Shrink the iPad 2 screen down to 7.85-inch dimensions and you get a tight pixel density that just six months ago would have been considered dazzling. I dismissed early reviews snorting that the screen was somehow “terrible” as link-baiting, quotable bloggerismo. At least so I thought until I got my hands on one and started using it for a couple of days. 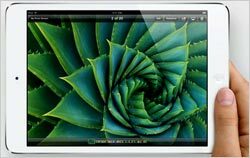 From the get-go, the iPad Mini display appeared to me diminished from the experiences I was accustomed to across all of my daily screens. The place where it is most obvious is in Web browsing, precisely because the Mini insists upon squeezing the experience into the same format as a full-sized iPad. The text on a three-column Web site becomes minute. And if you try to view that site in portrait mode and strain to focus on the miniaturized text headlines without zooming, the fuzziness of the text becomes clear. Interestingly, the iPad iOS interface itself is not too soft. But the snappiness of text on the browser and in the main menus actually make the effect of soft text on Web sites and in some apps all the more striking. There is much more to be said about the Mini, and I will give it a fair hearing in a subsequent column after I live with it for a while. After experimenting with but never embracing the smaller tablets from Amazon, Google and Barnes & Noble in the last year, I am curious about whether a smaller but full-blown iPad will help legitimize the half-sized format for general use. But my initial negative response to living briefly so far with the display underscored how much my eye is expecting pin-sharp clarity from displays. As I played with the Mini in front of the 60-inch Sony HD TV last night, I realized how much more vibrant and sharp the TV experience was. That expectation of HD-ness is being reinforced now by a range of screens, from my 27-inch desktop Samsung LED to the TV to the iPad and iPhone (even iPod Touch) Retina displays and even a laptop, Google Nexus 7 and some of the stunning displays I have been seeing on the Nook HD models. The reality is that many of us simply are HD spoiled. Decadent as that may sound, it has occurred in fairly short order. On the other hand, you could say that the rise of HD across all screens is only decadent in the context of digital media history. It has taken 30 years for our screens finally to catch up to analog reality and resolve the way print has for centuries and nature itself has since creation.